Visiting the San Francisco Golden Gate Bridge is an experience like no other. It's towering presence makes you realize just how amazing this iconic structure is up close. You will awe at its beauty and you might even get a little tingle of excitement in your legs as you look down at the water on your walk across. 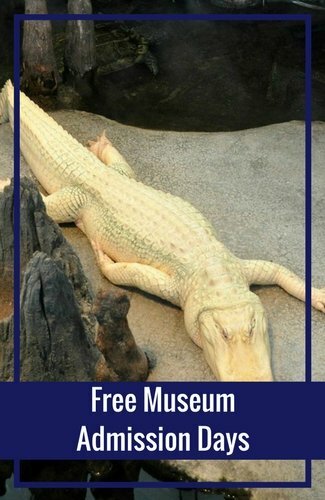 There are plenty of ways to enjoy your time at this historic attraction. You can stroll along its eastern walkway, drive over it, or stop to take pictures at either the north or south lookout points. You can also take a cruise under the bridge or take a helicopter tour over the bridge. 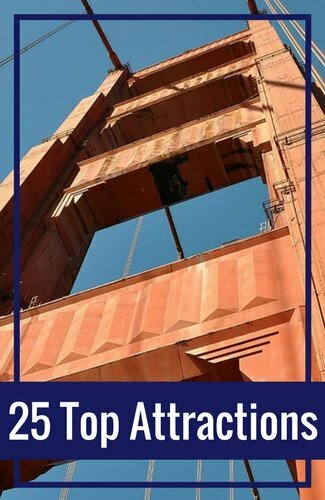 Here you will find a variety of tips to visit the Golden Gate Bridge as well as some fun facts, a little history, what's nearby, and movies where it made an appearance. If you want to learn more about a specific topic, click the links below to learn more. Today, nearly 112,000 cars cross the San Francisco Golden Gate Bridge every day. That equals almost 41 million cars a year! The two large towers stand nearly 746 feet above the water, similar to the height of a 65-story building. The towers are tall, but they are both hollow. The two main cables that string the bridge from one side to the other are around 3 feet thick. In total, they contain around 80,000 miles of steel wire. display near the Welcome Center on the southern side of the bridge. San Francisco is a very windy city, especially along the water, so they had to build it to hold up to these conditions. The San Francisco Golden Gate Bridge is strong enough to withstand wind up to 100 miles an hour. 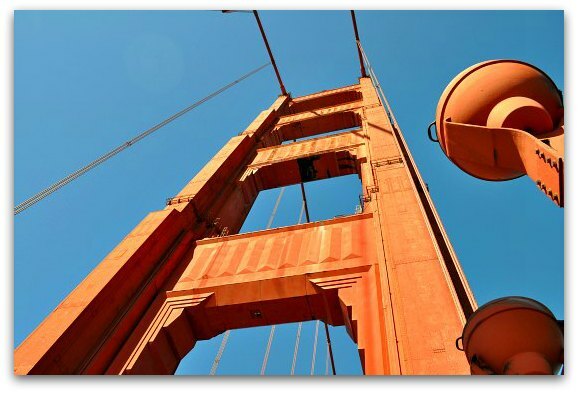 What color is the San Francisco Golden Gate Bridge? The actual color is 'Orange Vermilion.' However, it is more commonly referred to as International Orange. The original builders painted it this color so it would blend into its surroundings. Is it repainted each year? Many people are told that they paint it from end to end every year. This is not true. It's has only been fully repainted a few times since its completion. To maintain it, they do touch ups all the time and have a full-time maintenance crew. How did it get its name? The San Francisco Golden Gate Bridge sits in the Golden Gate Strait, which is where it got its name. What does it connect? It connects the city of San Francisco to Marin County. Prior to the bridge being built, you would either have to drive a considerable distance or take the car ferry. You can see one of the original car ferries for this route at the Hyde Street Pier. Can you see it from Fisherman's Wharf? Can you see it from Alcatraz? Yes, you can see the San Francisco Golden Gate Bridge from both Fisherman's Wharf and Alcatraz. If time is short, you don't have to venture all the way over to it in order to admire its beauty. In fact, you can see it from most points along the city's northern waterfront. It is a little overwhelming to drive over the San Francisco Golden Gate Bridge for the first time -- so you might have to work hard to concentrate on the road and not the scenery. There are six lanes and they are not very wide, so make sure you are watching the road as much as possible. Insider's Tip: The right-hand lane in both directions is the widest of the three, so use this one when you cross. This is the one that trucks and buses use, which is why it is slightly wider. How do the tolls work? The Golden Gate Bridge toll is just for southbound traffic. You no longer need to stop to pay the toll. When you reach the toll plaza, simply continue driving. There are no longer any human toll takers at the toll plaza, so you have a few ways to pay for your toll. You can either use FastTrak, pre-pay online with a credit card, pay online after with a credit card, or wait until you receive an invoice in the mail. They take pictures of your license plate, so the owner of the car will get the bill in the mail if it hasn't been paid. This is what it looks like as you are driving on the bridge. I'm on the bus, so am a little higher, but this will give you a sense of what it's like to drive on it. This is coming into SF from Marin, but both sides look the same. If you have a rental car, talk to the rental agency about their policy before crossing any bridges. They typically have a policy on how to pay for the tolls, so make sure you know before you leave with your car. The toll is currently $7 for those using FastTrak and $8 for those paying through the mail or online. Can you walk over the San Francisco Golden Gate Bridge? Yes, there is a walking path on the eastern side of the bridge dedicated to both walkers and bikers. No motor vehicles are allowed. You can access the walking path from either the north or south side of the bridge. You can walk the entire way across (1.7 miles) or just walk part way. Most people choose to walk just to the first tower and then turn around. However, you can go as far as you want. The bridge gets really crowded during the high season, on weekends, and holidays. There are a couple of ways to avoid some of the crowded sidewalks during this time. You can either head over first thing in the morning (which is usually when it's still foggy and a bit cool) or you can enter from the north end. The walkways are open starting at 5am every day of the year. They close at 6:30pm when it's PST (early November to early March) and at 9pm during Daylight Savings Time (early March to early November). At closing time, there are gates that automatically go down on both sides of the walking path so you can no longer enter. Don't forget to bring you camera too during your walk. You can get some amazing shots of the bay, Alcatraz and its large towers. You will want to layer your clothes in case it gets warmer or cooler during your walk. It is amazing how beautiful it can be below and then how cold and windy it will feel on the bridge. Make sure you are prepared for either temperature. Can you climb the bridge? No, this is not an option. The only way to climb the bridge is to become part of the maintenance crew! You have two options if you decide you want to bike over the San Francisco Golden Gate Bridge. You can either go on a guided tour or rent a bike to go on your own. Here is a little more about each option. 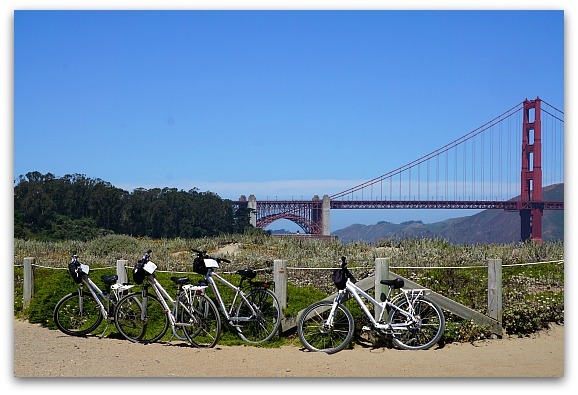 San Francisco Golden Gate Bridge Bike Tour: The guided tour starts in Fisherman's Wharf. After a ride along the waterfront, you will head up the hill to the bridge. You will then slowly bike over it as you learn about its history and what it took to build it. You will also get the chance to take some pictures of the amazing landscape and SF Bay attractions. You then continue to Sausalito, a small coastal community just across the bay from San Francisco. This part of the journey takes you up and down a few hills, but nothing too steep. The guided portion of your ride ends here, so you have the rest of the day to explore Sausalito, grab some lunch, and do a little shopping on your own. You can then either bike back to San Francisco or take the Sausalito Ferry. Your ticket back on the ferry is included in the price. I highly recommend taking advantage of the ferry ride back. This package includes the bike, helmet, and other biking essentials (such as a lock for your bike while you are visiting Sausalito). 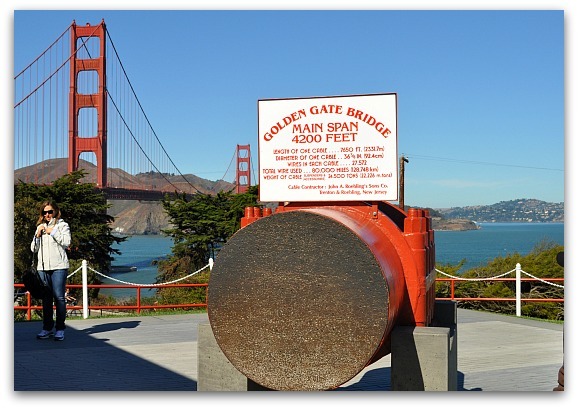 Find dates and times for this Golden Gate Bridge tour on GetYourGuide. San Francisco Day Bike Rental: If you prefer to bike at your own pace, your other option is to rent a bike for the day. This way you can come and go as you want. You can spend a little time biking around the city first, or just head straight over to the San Francisco Golden Gate Bridge. The bike rental company will provide you with some guidance and maps, so you don't get lost. Your all-day bike rental includes a mountain bike, helmet, handlebar bag, and lock. You can pick up your bike any time after the bike shop opens (usually around 8am) and drop it off no later than 15 minutes before closing (usually around 6pm or later during the busier season). 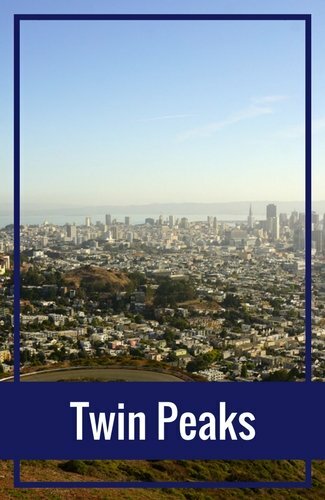 This gives you almost 10 hours to explore the city, the Golden Gate Bridge, and Sausalito. Book your all-day bike rental on GetYourGuide today! In addition to the popular biking tours, you will also find a variety of other types of San Francisco Golden Gate Bridge tours. Here are four of my favorites. 1. 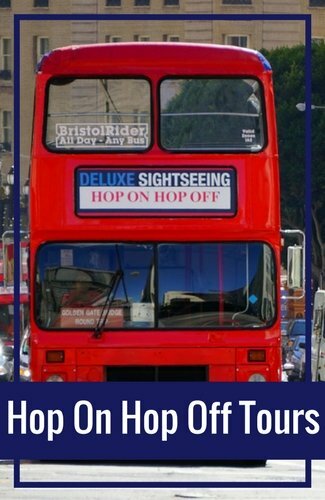 Hop On/Hop Off Bus Tour: The Hop On/Hop Off Bus includes around 20 stops throughout the city. You can get off and back on at any stop along the way. You can also spend as much time as you want at each stop. This open top bus will take you over the bridge to Vista Point on the north side. You can either hop out or just admire the bridge from the bus. It runs daily and is a great way to see the bridge as well as many of our top attractions. Find out more and check for tickets on the City Sightseeing site. 2. Fire Engine Tour: On this expedition, you (and up to 12 other people) will enjoy some time on a big red shiny Mack Fire Engine. 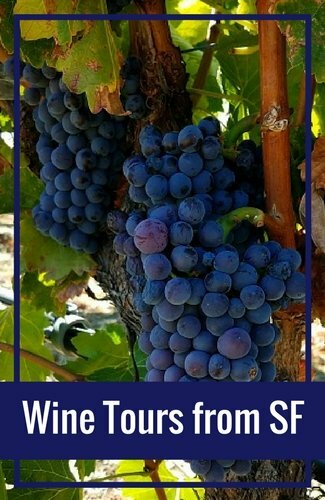 This open-air tour starts at The Cannery in Fisherman's Wharf. You will ride through the Presidio, drive over the bridge, and then make your way into Sausalito. On the way back, you will stop at the Fort Baker lookout point. Here you will get some amazing views of the Golden Gate Bridge, the San Francisco skyline, and Alcatraz. After this stop, you will drive back over the bridge. This tour includes access to authentic firefighter gear so you can stay warm on those chilly San Francisco days. It's about a 90-minute tour and is offered a couple of times a day. Find out more and check for ticket availability on Viator. 3. Bay Cruise: Instead of walking or driving, how about cruising under it? For a completely different vantage point, check out one of the bay cruises. 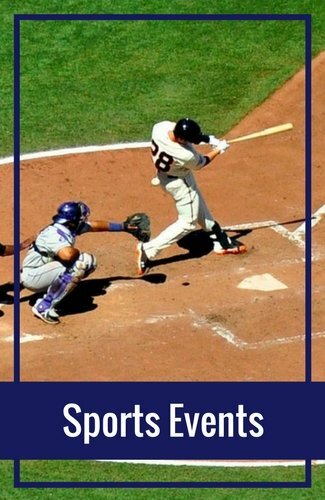 This is another great way to learn about the San Francisco Golden Gate Bridge. It also gives you a completely different view of it for some amazing photos. This 60-minute tour cruises under the bridge twice. You will also learn a little more about other buildings in the city and pass by Alcatraz Island. The boat has indoor and outdoor seating. There are also restrooms and a seasonal snack bar. This is the perfect way to get up close to the famed attraction and learn more about it. Find discounted tickets for this cruise on Goldstar. 4. Helicopter Tour: Are you looking for something a little more adventurous? Wouldn't it be cool to see the Golden Gate Bridge from above? If you love a thrill and are looking for a once in a lifetime experience, then consider a San Francisco helicopter tour. This magical journey starts with a shuttle from one of two central locations in San Francisco. Once you arrive at the helicopter, you will immediately board and get started on the amazing adventure. Your helicopter ride includes 15 to 20 minutes of flight time. The flight is choreographed to music with spontaneous narration by your professionally trained pilot. It's an experience you will never forget! It runs three times a day. Find out more and check for availability on GetYourGuide. 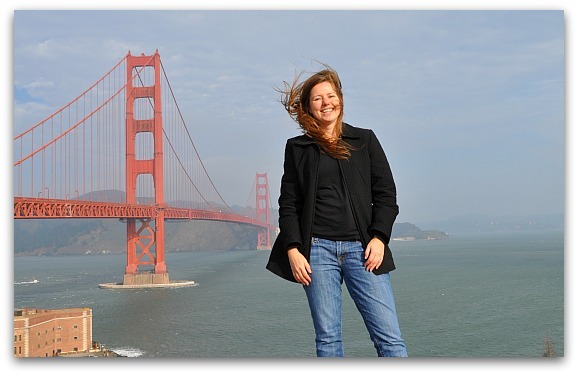 What is the weather like at the San Francisco Golden Gate Bridge? Due to its location, you will find it's cool and windy up at the bridge most of the year. The temps up here are about 5 to 10 degrees cooler than what you will find in other places around the city. The cool breezes come in from the Pacific Ocean into the bay, so it's quite windy up here all year long. Me at the bridge on a normal windy day! I recommend wearing layers, so you can add and remove items as necessary. It's often windy even at the look-out point and is usually even windier on the walkways. Here are more tips on what to wear by month--and remember take off a few degrees for each one when thinking about what the weather might be like at the San Francisco Golden Gate Bridge. The San Francisco Golden Gate Bridge sits on the northern end of the city. You will find plenty of things to see and do nearby. Crissy Field: To the east of the bridge, you will find Crissy Field. This green space offers a walking trail, a couple of places to eat and a beach. You can also hang out with friends and family at the picnic area or just admire the bridge from below. Fort Point National Historic Site: This San Francisco attraction is right below the bridge. In fact, it was originally slated to be torn down to make way for the bridge, but a last-minute plea saved the building. The plans for the bridge had to change to accommodate it and it's a fun place to visit. Plus, you can get some breathtaking views of the bridge from the top level. Learn more here. Baker Beach: You will find some amazing views of the San Francisco Golden Gate Bridge and the Marin Headlands from this attraction inside the Presidio. It's a cool beach with amazing views. On a warm day, there is no better place to be. Find out more about visiting Baker Beach. Presidio: The Presidio is an old army base that now offers a variety of things to do. You can visit some cool museums, go bowling or stroll along the Coastal Trail. Find out more here. You will find two places to eat right at the bridge. I've also included a couple of places nearby that I think you will enjoy. Round House Cafe: Above is a picture of the Round House Cafe. They use health, locally sourced items for their fresh salads and sandwiches. It's a great casual spot right next to the walkway to get onto the bridge. It's open from 9 am to 6 pm. 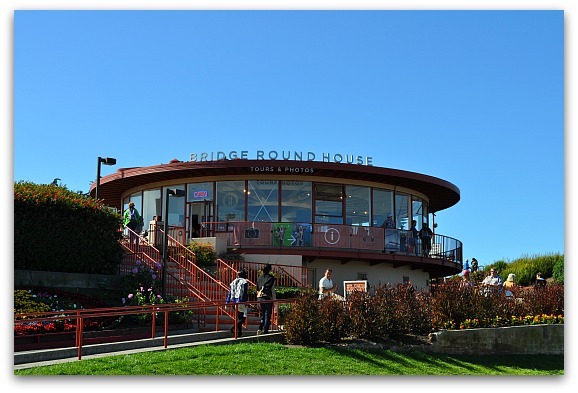 Bridge Cafe: The Bridge Cafe is another place to grab a few snacks. Everything here is grab and go, so you can pick-up something quickly for your visit. It's also open from 9 am to 6 pm daily. Warming Hut: The Warming Hut is a very popular salad and sandwich spot that is in Crissy Field. To find this, you will need to walk down the stairs from the bridge or re-park your car at one of the Crissy Field parking lots. You will find it at 983 Marine Drive. This is one of my favorite spots when I'm out exploring this area. Chestnut Street Restaurants: You will find a wide variety of options along Chestnut Street in the Marina. This is about two miles away from the bridge, but has a large selection of options including burgers, Italian, Mexican, seafood, and a variety of other places to grab lunch or dinner. Presidio Restaurants: You will also find some cool places to eat in the Presidio. Two of my favorites are right by the Lombard Gate: Presidio Social Club and Sessions at the Presidio. You will also find a few other options further into the Presidio. 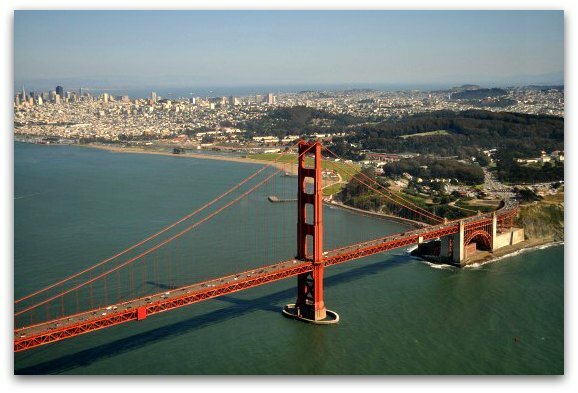 You will find several hotels nearby the San Francisco Golden Gate Bridge. Here are just a few of my top picks. The best way to get here is to take the bus and you will find a couple of options. The SF public transit system, Muni, offers one bus that will take you all the way to the Welcome Center on the southern end. The 28 runs all the way from Fisherman's Wharf to the bridge and then all the way to the Daly City BART station. It runs along Lombard Street and 19th Avenue, which is where you will find the majority of the stops. It runs through Golden Gate Park too, so you can easily get between these two attractions. This one is the best option if you are coming from Fisherman's Wharf. 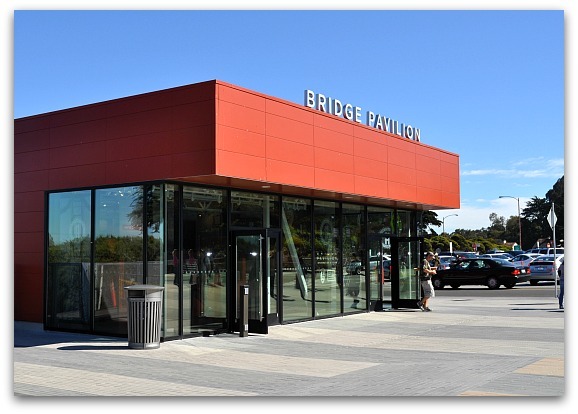 You will also find that almost all of the Golden Gate Transit buses stop at the bridge. They have both commuter buses and hourly buses that will take you from the Financial District, the Civic Center, and places in between to the bridge. The downside to using this option is that the price is double what the SF Muni #28 option will cost. 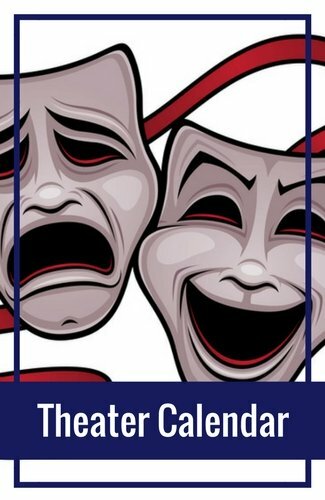 However, it will also take you less than half of the time to get here if you are coming from Union Square, South of Market, the Civic Center or places in between. 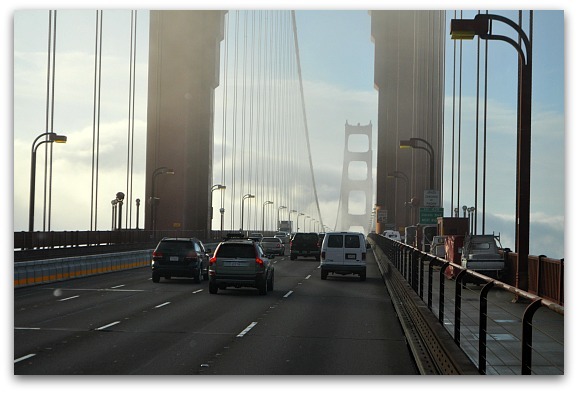 The Golden Gate Transit bus drivers will often discourage you from using their buses to get to the bridge. If you don't mind paying more (usually about $4), tell the driver you are okay with the added cost and hop aboard. It will be easy to see which stop is at the bridge. How far is it from the SFO airport? 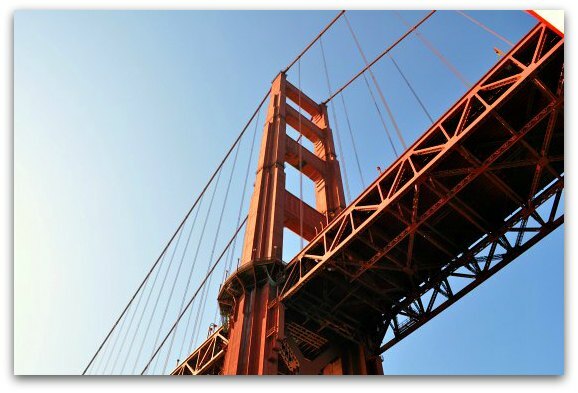 Do you have a long layover at SFO and want to check out the San Francisco Golden Gate Bridge? It will take you about and hour and 15 minutes by public transport or about 45 minutes by car. If you want to take public transit, simply hop on BART at the airport. Take it to the Daly City stop and then catch the #28 bus. Reverse the route to return to the airport. I only recommend doing this if you have plenty of time (at least 5 hours as you will have to return through security). Parking is very limited at the San Francisco Golden Gate Bridge. There are five lots that are near the bridge overlook points. In total, there are just over 250 spots in these lots. I highly recommend taking other means of transit to get here. However, if you are only able to get here by car, here are a few tips to find parking. 1. Welcome Center Lot (south side): The southern end (SF side) of the bridge has a small lot by the Welcome Center. There are only 25 spots for noncommercial vehicles, plus three handicap spots for those with placards. These spots cost about $.25 for every 15 minutes. They turn over quite often, but you will have to continue to drive around until a spot opens as there is no waiting area. You can access this lot off Highway 101. Plug in "Welcome Center for the Golden Gate Bridge" into your GPS or phone to get specific directions. 2. 6302 Merchant Road Parking (south side): There is a second lot on the other side of Highway 101. This is another small lot with 4 hour parking. This lot has about 45 spaces with a few handicap spots. Most are compact only, so the spaces are tight. This one is about a 5 minute walk over to the Welcome Center. However, you can access the trails from this one for some amazing views of the San Francisco Golden Gate Bridge. To find this one, plug in "6302 Merchant Road Parking" to get specific directions. This one isn't usually as crowded as the first one I mentioned, since not as many people are familiar with it. 3. Battery East (south side): A third option on the south side is the Battery East lot, which is also about a 5 minute walk to the Welcome Center. This one is also small with about 50 spots in total. You will find this one by typing in "Battery East, Lincoln Blvd, San Francisco, CA 94129" into your GPS or phone to find its entrance. 4. Vista Point (north side): If you want to visit the northern end of the San Francisco Golden Gate Bridge, you will find parking at Vista Point. You will find this by driving over the bridge (stay in the right lane) and watch for the signs. There is just one way into this lot. This one is a little bigger, but is really busy. Be careful as you drive through this lot looking for a spot because people are excited to see the bridge and aren't paying attention as much as they should. This one has about 120 spots with about 10 handicap only spaces. When Vista Point gets too full, they will shut it down to new cars entering on busier days. You will see a sign that says "Buses Only." If this one is full, you can find a second lot on the northern side of the bridge just across Highway 101. 5. North Tower Golden Gate Parking (north end): To find this lot, you will need to leave Vista Point, hop back on Highway 101 (stay in the right lane), and take the first exit (the sign will read Alexander Avenue). Take this to Alexander Avenue (follow the signs that are taking you back to San Francisco), take a left and drive under 101. Take another left and in less than a half mile you will see a sign that ways "Marin Headlands" with an arrow. Turn right here which will take you slightly up hill (if you continue straight--you will end up back on 101). After you turn, you will see a sign that say "Parking/Trailhead." Follow this sign (left turn) and it will dead end into another parking lot. This lot has about 40 spots with a few handicap only spaces. The San Francisco Golden Gate Bridge is frequently featured in movies and on TV. Here are 10 of the most popular shows where you can see this beauty on the screen. 1. Full House (1987-1995): This fun comedy was set in San Francisco. Although most of it wasn't filmed here, they included plenty of shots around town. Their opening starts with a view of the Painted Ladies of Alamo Square, the outside of their house was in Pacific Heights, and, of course, they filmed shots in and near the San Francisco Golden Gate Bridge. 2. The Room (2003): If you haven't seen this, you are in for a treat--sort of. It's one of the worst films of our time, but has gained a cult following. It features the bridge a couple of times in the movie. 5. Interview with the Vampire: The Vampire Chronicles (1994): Several scenes from this movie were filmed in SF. In total, its been featured in more than 100 TV shows and movies. The Golden Gate Bridge history starts in the 1930s during the Great Depression. Joseph Strauss wanted the San Francisco Golden Gate Bridge built to connect Marin County with the city. Many thought he was crazy and that building a structure in that location was impossible. However, Strauss received enough support and a bond was issued. His team and he received nearly $35 million dollars to build it. They were also told to complete it in four years. It ended up coming in under budget and earlier than originally scheduled. 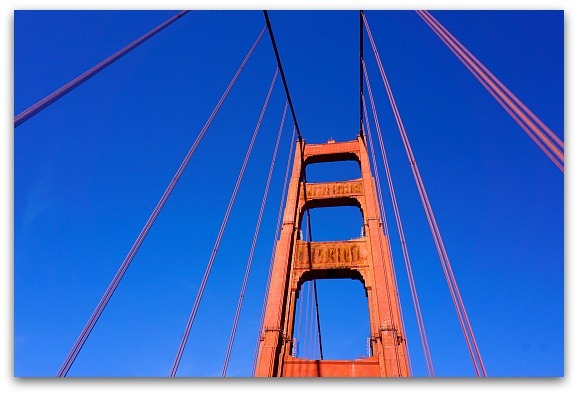 The San Francisco Golden Gate Bridge officially opened to cars on May 28, 1937. It opened to pedestrians just one day earlier.